In 1916 literate cowboy Devon Young reflects on his life's journey. Saved from death by a shamanic intervention, he embarks on a quest to rescue his love, Dahlia de Belardes, from banishment in California. Born in Derwentwater, England, in 1942, Philip James Daughtry is a descendant of American outlaws Frank and Jesse James. Daughtry entered the United States when he was thirteen. After dropping out of the University of Denver, he worked on wheat and cattle ranches in the Horse Heaven Hills of Eastern Washington and in Colorado, Nevada and Belize, and lived on a mudflat ferry steamer in Sausalito before hitching to Laguna Beach where he served a three year apprenticeship in the local painters union while completing undergraduate and graduate work at UC Irvine. He was involved in the “baby beat generation” during the 1970s San Francisco Renaissance. His work is widely anthologized, and his publications include The Stray Moon, Kid Nigredo, Magic Harness, Celtic Blood, and The Centaur's Son. 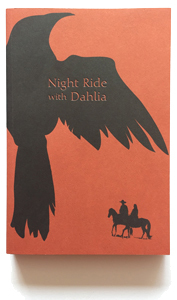 Night Ride with Dahlia is his first novel. He lives in Topanga, California, with his wife, artist Rita George. Cover illustration (horses) by Rachel Burgess.